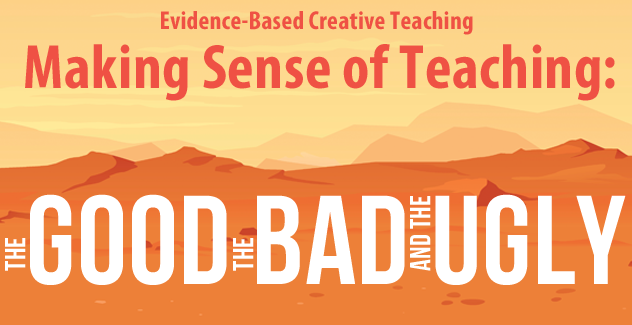 This is a series of five blog posts on Evidence-Based Creative Teaching (EBCT). EBCT is a Total Pedagogic Framework from which teaching professionals can creatively design and facilitate high impact learning experience across all delivery modes. In chapter 1 of my book ‘Creative Teaching: An evidence-Based Approach’ (Springer, 2015), I summarized what I learned in my 15,000 hours at secondary school (that’s approximately how long we spend there – according to Rutter et al, 1982). From my experience, the only useful learning was the ability to box and play football to an acceptable standard. Boxing was, in fact, a compulsory activity in my schooling in Hoxton, East London; Football akin to a religion. Boxing meant I could keep my lunchbox and eat its contents, which is pretty important in any hierarchy of needs. Football meant membership in the school football team and represented both high status and enjoyment; However, I did have some notable experiences with certain teachers that significantly affected my life choices in those years, and became a major focal point in my later professional teaching career path. One thing that stood out was that the teachers were not alike, far from it. The 1966 film “The Good, the Bad and the Ugly”, which starred one of my favourite actors, Clint Eastwood, comes readily to mind when thinking about my teachers. Let’s lump the bad and the ugly together and this was my maths teacher for ‘O’ level. Unintelligible on all counts, the lesson may have been in a Malagasy dialect. I sat the ‘O’ level mathematics exam in June 1968 and achieved the undistinguished grade of 9 (6 being the lowest passing grade at that time). You may be wondering what a grade 9 actually means in the context of mathematical competence? Well, if my Jack Russell would have sat the same exam, he could not have fared worse. Jack (what else would you call a Jack Russell) is a clever dog, but still hasn’t worked out how to open the fridge door and get to his chicken meal autonomously. Fortunately, in the following academic year, I had a change in maths teacher, Mr Edrich, and he represented an example of ‘the good’. What this meant is that we could actually understand what he was saying. He also recognized that we were far from confident or competent in maths, which was not rocket science to ascertain. However, instead of communicating any negativity towards us, he worked hard to slow down the pace of teaching and tried through countless examples to help us to understand and eventually do those basic factorization procedures. Gradually, I made some sense of how simultaneous and quadratic equations worked, a basic understanding was emerging and I could increasingly solve the questions set. However, it was not a sufficiently deep understanding as I re-sat the maths ‘O’ level in the November series and still failed it—but only just, a grade 7. The happy ending was that in the following June exam series in 1969, I passed comfortably with a grade 3. If I am honest, I don’t think I ever achieved a deep understanding of this type of maths, but passing it was crucial, as without it I could not have got a place at university on a BSc. Programme. It was a very high stakes exam. Mr. Edrich will never know his specific and positive impact on my life, and this is the norm for many teachers. Unfortunately I did not get round to thanking him at that time, as it’s only retrospectively, and much later, that I came to fully realize how important such teachers are. Here’s one more story, and it shows how both situation and serendipity can poignantly play out in shaping one’s life. In the mix there was a good teacher, and what a difference this made for me. Card playing was not part of the formal curriculum, even in an East London comprehensive school in the late 1960’s. However, that’s what we were doing in the last week of term (in fact most of the year in some classes). After all, who cared? Certainly not most of the teachers! We were on our way out to the world of work and fortunately gaining employment was not a difficult task in the 1960’s in London, England – it was indeed the “Affluent Society”, so aptly described by Kenneth Galbraith (1958). I had already secured a job as a trainee civil engineering technician, so all that mattered was killing time and having some fun in the last few days at school. However, all of a sudden our game was interrupted by the class teacher (Mr Remmington, as I clearly recall) who asked what game we were playing. He then asked me specifically what I was going to actually work as upon leaving the school. I replied that I was going to be a civil engineering technician. In response, he asked what this involved and what would I actually be doing as a civil engineering technician. An easy question for me at that time, “I will be designing houses”. At that point, I remember a somewhat paused silence, and then he asked what I was intending to do for the rest of my final week at school, which seemed a strange question at the time. I resisted the obvious answer of “trying to win the card games”—albeit the most truthful response I could have made. He then asked if I would be prepared to talk to a friend of his, who was an architect at one of the local borough councils. He went on to add that it might be more useful to me than just playing cards. Although not quite sure where this was going, I agreed and left it at that. It was not until later on in the day that Mr Remmington actually sought me out and provided the details of where to go and who I was meeting. This involved traveling to a local Town Hall the following day, and meeting the deputy borough architect, who was a friend or relative of Mr Remmington. Mr Remmington had clearly made some effort here to provide a stimulus for my thinking, which from his professional stance was a good decision. It all makes perfect sense to me now. The key learning point, and it was a big one, was that architects design houses (and other buildings), not civil engineering technicians. He also showed me what civil engineering technicians do, which turned out to be not as attractive as I first thought at that time. It had the desired result that perhaps Mr Remmington intended, in that it got me thinking. As a result, that evening over dinner, I mentioned to my parents that I may not want to be a civil engineering technician and was considering being an architect, and this would involve staying on at school for 2 more years and studying for ‘A’ levels. My mother was a little shocked as she was expecting me to go to work as all my friends were already in the workplace and earning money. My father, on the other hand, lit up and said something akin to “What a great idea!” He recalled how he was offered a scholarship to go to architectural college, but alas the second-world war broke out and he spent many years fighting in it. Towards its summation he married a young Italian woman and, on returning to England, had to get a job to earn money in order to live. Studying at university or wherever, was not an option for him at that time. However, he had always wanted to be an architect, and had no reservations in supporting his only son in such a positive career choice. This was perhaps also helped by the fact that I was an only child and both my parents worked. In the context of East London in the 1960’s we were relatively well off in comparison to many of my schoolmates. At the end of my school life, I did not pursue a career in architecture but did become one of a very small cohort of pupils from Edith Cavell Secondary School who went to university. Hence, school was indeed a combination of the good, the bad and the ugly, but I did learn a lot, though not that much from the formal curriculum. Has there been an Educational Jurassic Park? Teachers/researchers seek evidence to buttress their models of learning and thus rarely seek to refute them or introduce major changes. Another part of the explanation is that teaching has been akin to fashion, in that it goes through periods of reframing of what is in and what is out. For example, models of what constitutes good teaching have oscillated between periods of ‘traditional methods’, then ‘progressive method’s, then ‘back to basic methods’, then ‘discovery methods’, and the new phrase in some quarters is ‘the teacher is no longer the sage on the stage, but the guide on the side’. Oh really! This does little to convince anybody that teaching is truly a profession with well constituted bases of professional knowledge, as is the case for medicine and engineering. I have frequently referred to this an as ‘Educational Jurassic Park’, and the analogy may resonate with readers who have been in (or around) teaching for some decades. Fortunately, we may be coming out of it, and here’s why. Over the past decade or so, knowledge relating to human learning has rapidly increased, especially as the fields of cognitive and social neuroscience are providing further insights into brain functioning at the neurological level, and how this plays out in terms of human cognition and behaviour relating to learning. Equally, extensive research on teaching methods suggests that there is a strong empirical base as to which teaching methods tend to work best, and on what basis. Perhaps most publicized in this area is the work of Hattie (e.g., 2009; 2012), though many others have been providing significant contributions over the past two decades (e.g., Bransford, 1999; Marzano, 2007; Mayer & Alexander, 2010). …embark on a revolution, and like medicine, abandon both custom and practice, and fashions and fads, to become evidence-based (cover page). My posts that will follow will detail the nature of this revolution in teaching, the components of Evidence-Based Creative Teaching, and how the framework enables more teachers to become “naturals”, knowing specifically what this entails and how it works. Darling-Hammond, L. & Bransford, J., (2005) Preparing Teachers for a Changing World: what teachers should learn and be able to do. Jossey-Bass, San-Francisco. Drucker, P., (1999) Quote. Available at: https://www.brainyquote.com/quotes/peter_drucker_108040. Last accessed, 22nd December, 2017. Galbraith, J. K., (1958) The Affluent Society. Houghton Mifflin Harcourt, New York. Hargreaves, A & Fullan, M., (2012), Professional Capital: Transforming Teaching in Every School. Teachers College press, New York. Hattie, J., (1999) Influences on Student Learning. Inaugural Lecture, University of Auckland, August 2. Hattie, J., (2009) Visible Learning. Routledge, New York. Hattie, J., (2012) Visible Learning for Teachers: Maximizing Impact on Learning. Routledge, London. Izumi, T. L. & Evers, W. M., (2002) Teacher Quality. Hoover Institutional Press, San Francisco. Marzano, R. J., (1992) A Different Kind of Classroom. VA: ASCD: Alexandria. Marzano, R. J., (2007) The Art and Science of Teaching: A Comprehensive Framework for Effective Instruction. ASCD. Mayer, R.E. & Alexander, P. A., (2010) Handbook of Research on Learning and Instruction. Routledge, London. Petty, G., (2009) Evidence-Based Teaching: A Practical Approach. Nelson Thornes, Cheltenham. Rutter, M. (1982) Fifteen Thousand Hours: Secondary Schools and Their Effects on Children. Harvard University Press, Cambridge MA. Sale, D., (2015) Creative Teaching: An Evidence-Based Approach. Springer, New York.